See that empty seat front and center? 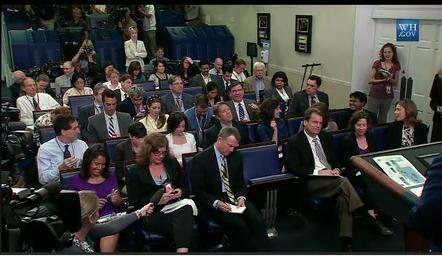 That was Helen Thomas' official seat in the White House press pool, the only such designation in the press room. It was given to her in honor of her 57 years of covering presidential press conferences. In the wake of her resignation, three news services are vying to take Thomas' seat: Fox News Channel, Bloomberg and NPR. But let's be honest: giving Fox News Channel--the same outlet that elevated Breitbart's ACORN and Sherrod scandals to national prominence, that continues to push the NBPP non-story, that employs that inciter of insanity, Glenn Beck--the seat is a slap in the face to any American who actually cares about news. There's a new front where we can chip away at the perceived legitimacy of FOX as a news organization. Do not give Helen Thomas' seat to FOX ! They are NOT news...they are a politically motivated racist organization who lie, distort and deceive viewers to promote a specific political agenda. They have FCC complaints filed against them for using their "news" status contrary to federal rules against bias and distortion in the news. The recent scandals where Fox assisted in slander and personal attacks against blacks such as Shirley Sherrod, Van Jones and Acorn all indicate their inability to present news using accepted and honorable journalistic standards. Putting FOX in that chair would be a black mark on your organization as it would amount to an acceptance of their extreme distortions as being the equal of your other distinguished members.